(originally known as El Paso de Robles or The Pass of Oaks) is ideally situated halfway between San Francisco and Los Angeles along California's Central Coast. The rolling hills studded with oak trees and grape vines attracts not only tourists but many people looking for that ideal place to relocate. will appeal to a wide range of visitors and residents. There are several recreational lakes, golf courses, county and state parks, nature preserves, hiking and biking trails, and beaches to appeal to any nature lover. Shopping trips to downtown San Luis Obispo, Paso Robles, Morro Bay and Cambria should provide ample opportunity to find many treasures. Restaurants and nightclubs abound with so much culinary and musical variety that any "taste bud" will be satisfied. 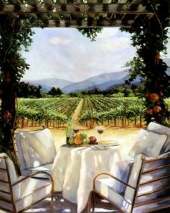 If relaxing with a glass of wine and a fabulous view is more to your keeping - you won't be disappointed with the more than 40 wineries in San Luis Obispo County. 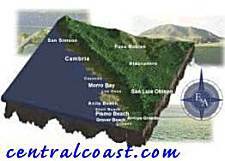 Click on these links to visit the web sites for the Central Coast and the Paso Robles Chamber of Commerce. You will find information on lodging, restaurants, camping, local businesses, parks, festivals and events and so much more.